Hey, hey, hey; more positive (sounding) transport news, hot on the wheels of the Victoria Tube revamp we recently highlighted. According to the Beeb, Network Rail are to invest ‘£4bn into improving the UK's stations over the next 10 years’, including several London termini. 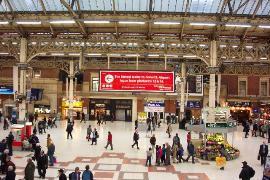 As well as much needed refurbs, Euston, Waterloo and Victoria would also see associated commercial and residential developments. Euston Station already has a very large residential population, most of whom smell of piss and beer and throw stones at the moon. Well now you can join them. Victoria Station, England's busiest passenger terminal, could have a tower at the back of it, if engineers are able to build over the tracks. Ah, a tower. Why, that should cut delays in half. Actually, it could cut trains in half if they literally build it over the tracks. Anyway, more details are promised at the end of the year.